Much hydrogeological and groundwater information and many resources, including detailed maps, reports and other documents, are available for Namibia. 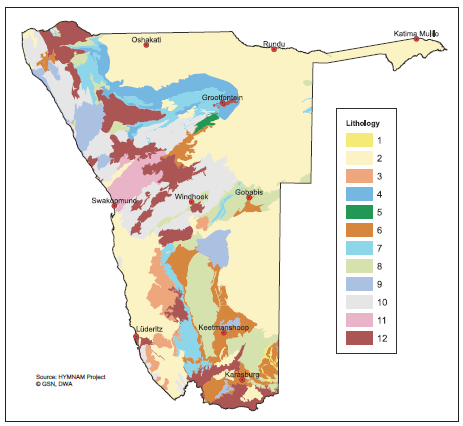 This page provides a summary of hydrogeological understanding and groundwater resources in Namibia, and links to some of the many available resources. Namibia is one of the most sparsely populated countries in Africa. Early inhabitants were San and other hunter-gatherer peoples, prior to the 14th century expansion of Bantu people into this region. In the late 19th century the region was colonised by Germany as South West Africa. Resistance to German rule was followed by the genocide of Herero and Namaqua people between 1904 and 1907, for which Germany formally apologised in 2004. South Africa took control of South West Africa after defeating German troops in World War I, and established a white minority rule similar to the South African apartheid system. In 1966, a resistance movement developed into armed struggle. In 1968 the United Nations declared South Africa’s continued occupation of Namibia illegal, but conflict continued throughout the 1970s and 80s. Independence from South Africa was achieved in 1990, after which the country saw a transition to multiparty democracy. Their shared history means Namibia’s economy is closely linked to South Africa’s. A key economic activity is mining, particularly of diamonds (discovered in the early 20th century) and uranium, which contributes about 25% of export earnings, so that GDP is rather dependent on world commodity prices. Manufacturing and services, especially banking and tourism, are also important sectors. A fast-growing sector is wildlife conservancies, which support tourism and contribute to rural employment. Although contributing less to GDP, agriculture – mostly subsistence livestock raising – is an important livelihood activity for about half the population. Agricultural land holdings are still relatively unequal, with the majority of agricultural land still owned by a minority of, mostly white, farmers carrying out mostly larger scale livestock raising, although land reform is underway. Namibia is an arid country with low rainfall and high evapotranspiration. The only permanent rivers are along the northern and southern borders. Across the rest of the country surface waters are ephemeral after seasonal rainfall, with many of them dammed. Groundwater supplies most water supplies across the country, from springs and boreholes, and in rural areas also from hand dug wells. There are a number of large scale piped distribution schemes transferring both groundwater and surface water to urban areas. The first large scale desalination project in Africa was constructed in Wlotzkasbaken in 2010, to supply a uranium mine and nearby urban areas. Please cite this page as: Christelis, Dierkes, Quinger, Matengu, Kirchner, Lohe, Bittner, Upton, Ó Dochartaigh and Bellwood-Howard, 2018. Namibia.Map developed from USGS GTOPOPO30; GADM global administrative areas; and UN Revision of World Urbanization Prospects. For more information on the map development and datasets see the geography resource page. 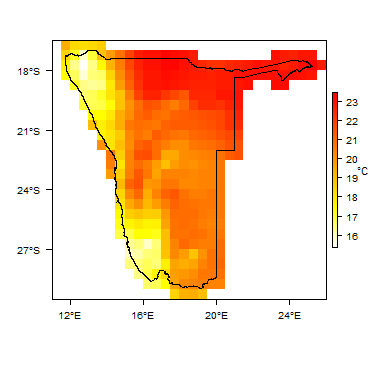 A summary of the climate of Namibia is also available in the report Groundwater in Namibia (ed. Christelis & Struckmeier 2001 (2011)). More information on average rainfall and temperature for each of the climate zones in Namibia can be seen at the Namibia climate page. 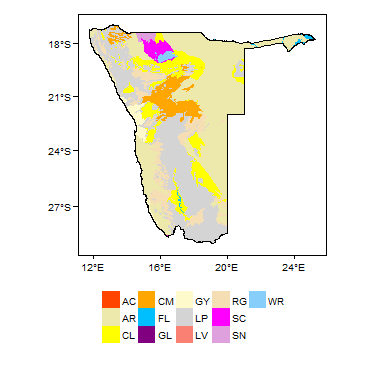 Information on the hydrology of Namibia is available in the report Groundwater in Namibia (ed. Christelis & Struckmeier 2001 (2011)). Major surface water features of Namibia. Map developed from World Wildlife Fund HydroSHEDS; Digital Chart of the World drainage; and FAO Inland Water Bodies. For more information on the map development and datasets see the surface water resource page. Information on soils in Namibia is also available in the report Groundwater in Namibia (ed. Christelis & Struckmeier 2001 (2011)). 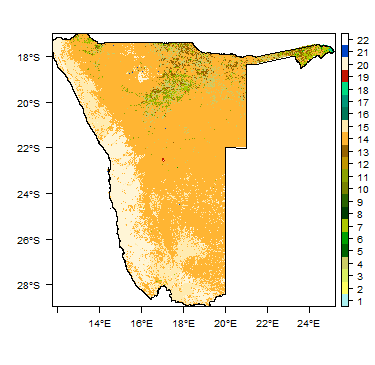 Soil Map of Namibia, from the European Commission Joint Research Centre: European Soil Portal. For more information on the map see the soil resource page. There are three main land cover types in Namibia: desert, savanna and woodland. The Namib Desert comprises most of the desert land cover class. Various types of savanna vegetation cover much of the country. Woodland, largely forest savanna, occurs across much of the more humid northeast and in perennial river valleys, and some ephemeral river valleys. Land Cover Map of Namibia, from the European Space Agency GlobCover 2.3, 2009. For more information on the map see the land cover resource page. An Atlas country geology map has not been developed for Namibia, as a higher resolution geology map, relevant to hydrogeology, is already available. The following summary of the geology of Namibia is based around 12 geological units that were defined according to their hydrogeological characteristics as part of the development of the Hydrogeological Map of Namibia (2001). This map, at 1 000 000 scale, was prepared as a Namibian – German technical cooperation project of the Department of Water Affairs and Forestry, Ministry of Agriculture, Water and Forestry; the Geological Survey of Namibia, Ministry of Mines and Energy; the Namibia Water Corporation and the Federal Institute for Geoscience and Natural Resources. The map is accompanied by a report Groundwater in Namibia (ed. Christelis & Struckmeier 2001 (2011)). More details on Namibia's hydrogeology can be found in the section below. Other geological maps are produced by the Geological Survey of Namibia. These include a simplified geological map of Namibia at 1:2 000 000 scale, a geological map of Namibia at 1:1 000 000 scale in 4 sheets (1980), and a series of geological map sheets at 1:250 000 scale covering parts of the country. More details are available from the Geological Survey of Namibia. The 1:1 000 000 scale Geological Map of Namibia (1980) can be viewed through the OneGeology portal. More information on the geology of Namibia can be found in the References at the bottom of this page. The following section provides a summary of the geology of Namibia from a hydrogeological perspective. In defining the 12 lithological (geological) units below, the main emphasis was on the groundwater potential of the rocks. Although stratigraphic relationships and spatial distribution were taken into consideration, some of the units include geological formations of more than one age or lithology. Hydrogeological lithological units in Namibia. The numbered units are described in the table below. Image courtesy of Christelis & Struckmeier 2001 (2011). Namibia has very diverse geology, with rocks from Archaean to Cenozoic age. Bedrock is exposed at the ground surface across nearly half of the country, while the remainder, across the Kalahari and Namib desert, is covered by unconsolidated superficial deposits. The youngest chapter of Namibia's geological history is represented by widespread Tertiary to Recent (<50 Ma) sediments of the Kalahari Seqence. Sedimentary and volcanic rocks of the Permian to Jurassic age Karoo Sequence occur in the Aranos, Huab and Waterberg Basins, in the southeast and northwest of the country. They are extensively intruded by dolerite sills and dyke swarms, linked to predominantly basaltic volcanism and a number of alkaline sub-volcanic intrusions, which mark the break up of Gondwanaland and the formation of the South Atlantic Ocean during the Cretaceous. The coastal and intra-continental arms of the Neoproterozoic Damara Orogen (800 to 500 Ma) underlie large parts of northwestern and central Namibia. There are platform carbonates in the north, and a variety of metasedimentary rocks that represent more variable depositional conditions further south. Along the southwestern coast, the volcano-sedimentary Gariep Complex is interpreted as the southern extension of the Damara Orogen. During the later stages of the Damaran orogenic evolution, shallow marine clastic sediments of the Nama Group, which covers much of central-southern Namibia, were derived from the uplifted Damara and Gariep Belts. The Mesoproterozoic (1800 to 1000 Ma) is represented by the Namaqualand Metamorphic Complex, which comprises granitic gneisses, metasedimentary rocks and magmatic intrusions, and by the volcano-sedimentary Sinclair Sequence of central Namibia, with associated granites (e.g. the Gamsberg Granite Suite). Palaeoproterozoic age (ca. 2200 to 1800 Ma) rocks in Namibia include metamorphic inliers of highly deformed gneisses, amphibolites, metasediments and associated intrusive rocks in the centre and north of the country. Other ancient rocks are the Kunene and Grootfontein Igneous Complexes in the north; the volcanic Orange River Group and the Vioolsdrif suite in the south; and the volcano-sedimentary Khoabendus Group and Rehoboth Sequence. 1 Sand and gravel valley deposits Alluvium Recent Recent sedimentary infill of valleys, including the courses of some ephemeral rivers. Occasionally extensive. 2 Unconsolidated to semi-consolidated sand and gravel, locally calcrete Kalahari Sequence; parts of the Auob and Nossab Members (Prince Albert Formation, Karoo Sequence) Cenozoic; Permian to Jurassic Abundant in the Namib Desert between Walvis Bay and Oranjemund. Further north, this unit occurs east of Terrace Bay and south of the Kunene River mouth, where dunes are locally developed. Also in this unit are infill deposits of the Kalahari Basin, which covers the entire Kalahari Sandveld, the Owambo Basin and the Kavango and Caprivi regions. In the south, between Tses and Keetmanshoop, consolidated sandstones of the Auob and Nossob Members, which occur along the Weissrand Escarpment, have also been included in this unit, because they frequently form a joint groundwater system together with the overlying Kalahari of the Stampriet Basin. 3 Unconsolidated to semi-consolidated sand and gravel, locally calcrete; with scattered bedrock outcrops Cenozoic; bedrock is mainly Proterozoic Similar to Unit 2, but also with scattered bedrock outcrops. This unit occurs in the Namib south of Lüderitz and to the east of the main Namib sand sea close to the Great Escarpment. The bedrock outcrops range from small hills to prominent inselbergs. 4 Calcrete A white, flat-lying, surface limestone, which is commonly developed in warm, arid and semiarid regions, where it forms by solution and re-deposition of calcium carbonate by meteoric waters. The lime forms a hard cement in sand and gravel beds, and can even replace pre-existing material. These calcretes are widely distributed in the area of Grootfontein and along the southern margin of the Etosha Pan. They also extensively cover some valley alluvial sediments. Most of the calcretes have been mapped by remote sensing methods from satellite images. 5 Sandstone Etjo Formation (Karoo Sequence) Permian to Jurassic Flat-lying aeolian sandstone. 6 Shale, mudstone and siltstone Prince Albert Formation; Omingonde Formation; Fish River Subgroup; Nama Group and Mulden Group (Karoo Sequence) Permian to Jurassic Part of the flat-lying Karoo Sequence in the Stampriet, Huab, Waterberg and Owambo Basins in southeast and northwest Namibia. These rocks were desposited in an environment with huge lakes and rivers at the end of the Dwyka glaciation, approximately 280 Ma (million years ago), when plate tectonic movements brought southern Africa - then part of Gondwanaland - from close to the South Pole to a more moderate climatic realm. The Prince Albert Formation overlies the older Dwyka Formation and comprises lacustrine grey to green shales, mudstones, limestones, sandstones and coal-bearing shales. Mid Permian Rocks in the Stampriet Basin consist of 600 meters of shales with thin limestone layers overlain by shale and sandstone. In the Huab Basin, mid-Permian rocks are represented by purple shales and sandstones. The Omingonde Formation of the Waterberg includes mudstones, red conglomerates, sandstones and grits, and is up to 600 m thick. The Fish River Subgroup and Nama Group represent southern molasse deposition during the Damara Orogen, and the Mulden Group a northern molasse, and both comprise shales. 7 Limestone, dolomite and marble Karibib Formation; Otavi Group; Naukluft Nappe Complex and Nama Group Neoproterozoic to Cambrian These rocks were originally deposited during the Neoproterozoic Damara Orogen, in an ocean formed during successive periods of intracontinental rifting, spreading and the formation of passive margins. The marbles of the Karibib Formation accumulated in a shelf area in northwest-central Namibia. The thick succession of dolomites and limestones of the Otavi Group today crop out in fold structures between Grootfontein and Opuwo. The Naukluft Nappe Complex contains appreciable quantities of flat-lying limestones. The limestones of the Nama Group were deposited in a shallow syntectonic foreland basin during the Damara Orogen. 8 Sandstone, conglomerate and quartzite Nosib Group; Auas Formation and Nama Group Neoproterozoic to Cambrian These rocks were largely deposited during the Damaran Orogen. They comprise the basal Nosib Group, which was laid down in, or marginal to, intracontinental rifts, and comprises quartzite, arkose, conglomerate, phyllite, calc-silicate and subordinate limestone. The deep water sediments of the Auas Formation were deposited on the edge of a narrow developing ocean. Flat-lying basal and upper sandstones of the Nama Group are found in southern Namibia. 9 Volcanic rocks Kalkrand and Etendeka formations (Karoo and younger) Permian to Jurassic; Cretaceous The Kalkrand Formation comprises a sequence of 180 Ma basalts in the Mariental area, which is about 360 m thick. The Etendeka Formation in northwestern Namibia is about 135 Ma. Both formations are flat-lying. Extensive dolerite sills and dyke swarms occur with the volcanic rocks, formed in connection with the continental break up of Gondwanaland. 10 Metamorphic rocks, including quartzite and marble bands Rehoboth and Sinclair sequences; Nosib Group; Ugab and Kudis Subgroups and Chuos, Karibib and Kuiseb formations Palaeoproterozoic to Cambrian These rocks extend from the Gobabis area to the Gamsberg region and then southwards to Helmeringhausen. The 1800 Ma Rehoboth Sequence is thought to have formed in the back-arc basin of a magmatic arc, and comprises schist, phyllite, amphibolite and quartzite. Rocks of the Sinclair Sequence accumulated within an intra-continental rift. Deposition of quartzites took place in narrow fault-bounded troughs in today’s Helmeringhausen-Solitaire area after a cycle of magmatic activity. Damaran rocks present in this unit include schists of the basal Nosib Group; marbles of the Ugab and Kudis Subgroups; schist, phyllite and amphibolite of the Chuos Formation; and marble, schists and amphibolites of the Karibib and Kuiseb Formations, including the Matchless Amphibolite Belt. 11 Metamorphic rocks, including quartize and marble bands, with granitic intrusions Neoproterozoic to Cambrian Including many of the same formations as Unit 10, but also including granites which were intruded into Damaran metasedimentary rocks in a broad zone between Otjiwarongo and Okahandja and the coast, during mountain building processes between 650 and 450 Ma. Individual granite bodies that are too small to be shown separately on the hydrogeological map (as Unit 12) are included here with the surrounding metamorphic rocks. 12 Granite, gneiss and old volcanic rocks Epupa and Kunene complexes; Orange River Group; Vioolsdrif Suite; Elim Formation; Khoabendus Group; Rehoboth Sequence; Namaqualand Metamorphic Complex; Sinclair Sequence; Fransfontein Suite and Gamsberg Granite Archaean to Jurassic This unit includes a multitude of lithologies that almost covers the entire geological history of Namibia. Vaalian rocks comprise the gneisses of the Epupa Complex and the intrusives of the Kunene Complex. Early Mokolian rocks include gneisses and meta-volcanics of the old metamorphic complexes, metavolcanics of the Orange River Group, granites of the Vioolsdrif Suite, gneisses of the Elim Formation and meta-volcanics and gneisses of the Khoabendus Group. Middle to late Mokolian rocks of this unit are the meta-volcanics of the Rehoboth Sequence, the gneisses of the Namaqualand Metamorphic Complex, the meta-volcanics of the Sinclair Sequence, the granites of the Fransfontein Suite, as well as the younger granites, for example the Gamsberg Granite. The unit also comprises a range of syn- to post- tectonic granites which intruded Damaran sedimentary rocks during the Damaran Orogeny. 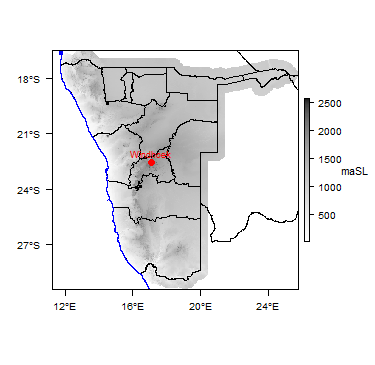 Complex igneous intrusions with ages of about 135 Ma occur in a zone extending northeast from the coast north of Swakopmund. Some of them are extremely complex layered intrusions and contain rhyolite, grano phyre, granite, syenite, foyaite, gabbro, dunite, pyroxenite and carbonatite. They are not related to any orogeny and are interpreted as resulting from a hot mantle plume. An Atlas country hydrogeology map has not been developed for Namibia, as a higher resolution hydrogeological map is already available. The hydrogeology of Namibia is described in detail in the report Groundwater in Namibia (Christelis & Struckmeier 2001 (2011)), which accompanies the Hydrogeological Map of Namibia. The following section provides a summary. Readers wishing more detailed information should consult the detailed report (Christelis & Struckmeier 2001 (2011)) and/or the references given below, many of which are available through the Africa Groundwater Literature Archive. 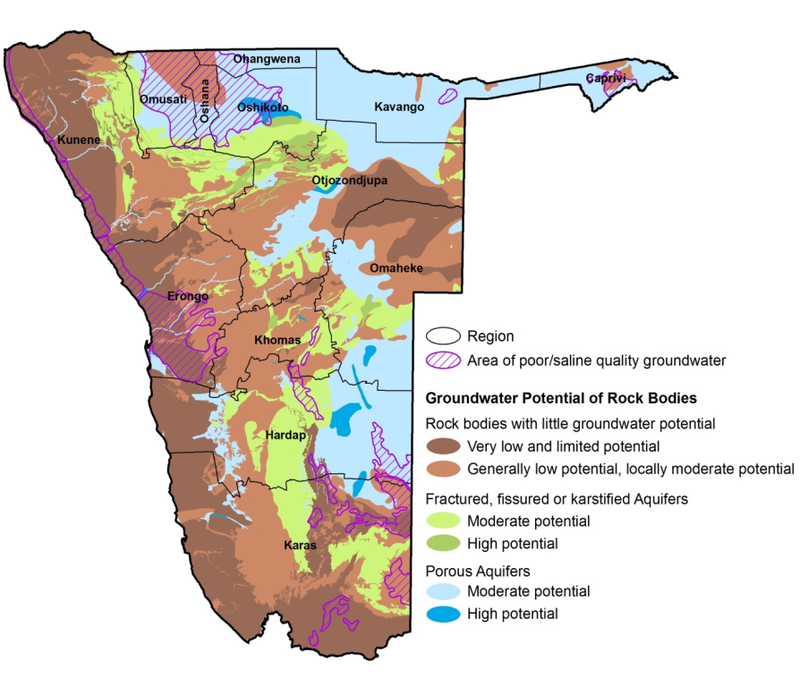 The aquifers of Namibia have been classed according to whether they are consolidated (hard rock) or unconsolidated; according to the type of porosity and permeability they show (porous/intergranular or fractured, fissured or karstified); and according to how much groundwater resource potential they have. They have also been qualified according to the presence of saline or otherwise poor quality groundwater. The hydrogeological map, shown below, shows the distribution of these aquifer types across the country. General properties of each of the main aquifer types are given in the table below. Namibia is also covered by the SADC hydrogeological map and atlas (2010), available through the SADC Groundwater Information Portal. About half of the country (48%) is covered by porous unconsolidated superficial deposits, largely the Namib desert and Kalahari deposits. The remainder of the country is directly underlain by consolidated rocks that have various degrees of fracturing, including karstification in some calcareous rocks. Over large parts of the country, groundwater conditions are unfavourable for various reasons: limited water availability; low and unreliable recharge; low borehole yields; deep water tables; poor groundwater quality; or high risk of contamination. However, in other areas there are high-yielding, very productive aquifers that contain more groundwater than is presently needed. 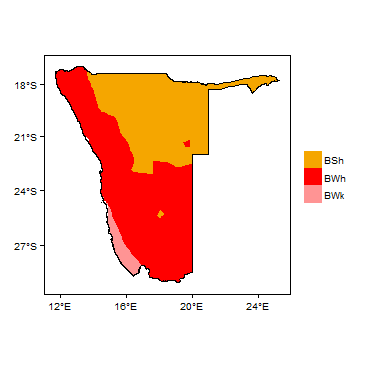 Rocks with low permeability cover 58% of Namibia: these are classed as aquitards where borehole yields are between 0.5 and 3 m³/hour, and aquicludes where borehole yields are less than 0.5 m³/hour). Only 42% of the country is underlain by aquifers, which are classed as rocks in which borehole yields generally exceed 3 m³/h. Some 26% of the country is underlain by porous aquifers and 16% by fractured rock aquifers. Highly productive aquifers, classed as those with average borehole yields greater than 15 m³/h, occur over only some 3% of the country (14 000 km²). Most of these areas have been declared as groundwater control areas (see Groundwater Management, below). It is estimated that on average only 1% of annual rainfall contributes to groundwater recharge. However, regional surface differences and geology must be taken into consideration and this therefore varies accordingly. Omaruru Delta (Omdel) (Unit 1) An alluvial aquifer formed of 4 palaeochannels: the Main Channel (MC); Northern Channel (NC); Northern Elevated Channel (NEC) and Southern Elevated Channel (SEC). The MC is the only channel with potable water. Sand layers are, on average, about 40, 65 and 20 m thick in the downstream, middle and upstream sections of the aquifer, respectively. Local lithological variations produce local aquitards. Transmissivity ranges from 290 to 700 m²/day, and storage coefficient ranges from 0.01 to 0.06 (Nawrowski 1990). The water table ranges from 19 to 55m depth and the aquifer layers are typically unconfined. Boreholes are between 12 and 124 m deep. Good quality Recharge occurs through leakage from rivers and by artificial recharge. Koichab Pan (Unit 1) The aquifer comprises semi-consolidated, fine to medium grained alluvial sand with intercalated layers of lower permeability clayey sands and clays that act as local aquitards, creating a typically semi-confined or leaky aquifer. The average aquifer thickness is 33 m.
Average transmissivity is 611 m²/day and average storage coefficient is 0.229. The water table ranges from 20 to 40 m depth, and the aquifer layers are typically unconfined. Boreholes are between 25 and 315 m deep. Kuiseb Delta (Unit 1) The aquifer lithology in most cases comprises fine to medium grained sand, with intercalated clay-rich layers/lenses. Layers of coarser sand and gravels, a few metres thick, are often found at the bottom of the succession, just above bedrock, and are considered to be the most productive part of the aquifer. The mean saturated thickness of the aquifer is 15m. Transmissivity is generally between 150 and 1600 m²/day and storage coefficient between 0.09 and 0.25. The water table is generally between 7 and 25 m depth, and the aquifer is generally unconfined. Boreholes are generally between 22 and 75 m deep. Cuvelai-Etosha Basin (Unit 1 and 2), including Ohangwena Aquifer System (Unit 2) This is a three layered system dominated by unconsolidated sand with some sandstones, with an average aquifer thickness of 220 m. It has a high primary porosity with no secondary porosity, and high horizontal connectivity. The average transmissivity value is 220 m²/day. The average piezometric level is 30 m below ground level, and the aquifer is mostly confined, but in some parts is unconfined. Typical borehole depth is 100 to 250 m. About 35% of the deep aquifer has groundwater that is unsuitable for drinking water. Mean annual recharge is 35 Mm³. Kalahari Perched Aquifer (Unit 2) The Kalahari Sequence has an average thickness of around 40 m. It has high primary porosity, and high vertical and horizontal connectivity. It has relatively low transmissivity, with an average of 26 m²/day. Groundwater levels are generally shallow. The aquifer is unconfined. In some areas it overlies, and is in hydraulic connectivity with, deeper and older fractured aquifers (see below). Windhoek Aquifer System (Unit 8) The Auas quartzites are highly fractured with high secondary porosity and permeability. A number of north to northwesterly striking faults and joints form the major groundwater conduits. Secondary porosity and permeability is best developed in faults with post-hydrothermal alteration and brecciation within the quartzites - secondary permeability is much more poorly developed in the associated schists. The aquifer is semi-confined. Piezometric levels vary from 8 to 150 m below ground level. Borehole depths vary from 100 to 400 m.
Generally good The aquifer is recharged mainly by direct infiltration of rainfall over areas of quartzite outcrop. A new system of artificially recharging the Windhoek aquifer has recently been tested. Treated water from Von Bach Dam is pumped into the Windhoek production boreholes and stored underground to reduce water losses from evaporation. Many years of abstraction have lowered the water table, creating enough open pore space to allow infiltration of up to 50 Mm³ of water when the dams are sufficiently full. Caprivi Aquifer (Nata Karoo Sub-basin) (Units 5 and 2) The Caprivi aquifer underlies the unconsolidated Kalahari Sequence (see above)and has an average thickness of 82 m. The formation has high primary porosity, and high vertical and horizontal connectivity. The average transmissivity is 193 m²/day. Groundwater levels are generally shallow. The aquifer is confined. Variable borehole yields from less than 1 to more than 20 m³/hour occur. Borehole depths vary from 50 to 150 m.
SE Kalahari Karoo Basin (Units 5 and 9) The aquifer is dominated by sandstones and shales, overlain by unconsolidated Kalahari sediments. Dolerite sills and dykes occur, more frequently towards the central parts of the basin, and sometimes enhance the level of fracturing within the sedimentary rock. The sandstones are characterized by a high primary porosity, and by secondary porosity fractures. There is a high horizontal connectivity while the vertical connectivity is generally low. The average transmissivity values are relatively low although the variation is relatively large within the system. The average transmissivity is 20 m²/day. Mean annual recharge is around 135 Mm³. • Aquifer over-abstraction, which occurs regularly in dry periods, and often results in water restrictions. A lack of monitoring and alternative water supply options contributes to this problem. • Aquifer management is often uncoordinated and water supply planning does not sufficiently include future developments. • A single borehole or well is often the only available water supply, especially in rural areas. • Groundwater resources are dependent on good rainfall, and subsequent recharge, during the short summer rainy season, and are therefore vulnerable to potential climate change. • Groundwater resources cannot sustain larger agricultural irrigation projects. These should be developed in areas with surface water supply, such as along perennial rivers or near water supply reservoirs. There is little anthropogenic contamination of groundwater in general, but untreated waste water in some communities causes degradation of quality. There are some cases of increased nitrate concentration linked to cattle farming, and some natural occurrence of elevated nitrate. The main groundwater quality problem is naturally high TDS and fluoride. The 2013 Water Resources Management Act introduced new and more stringent water quality guidelines, which will change the current status of safe water supply in the country. Groundwater that is currently considered safe for drinking will in many cases now be classed as sub-standard, particularly in smaller communities and rural areas. Water treatment will become increasingly necessary. Groundwater-surface water interaction is strong along the perennial rivers at the northern and southern borders (Kunene and Okavango in the north, Orange in the south), but this is not widely accounted for by the basin management bodies. Recharge of alluvial aquifers, especially in the coastal basins, depends on high run-off events in ephemeral rivers, which tend to occur at 4 to 8 year intervals. The Omaruru delta dam was specifically designed as an artificial recharge dam, where surface water runoff of the Omaruru River is stored and recharging groundwater is controlled through infiltration ponds. Many farm or earth dams exist in the country - estimates are up to 1000 - which are partly used to recharge groundwater to improve yields of water supply boreholes. The potential for storing surface water in, for example, the Windhoek Aquifer, is not currently fully utilised. Managed Aquifer Recharge (MAR) could be key to dealing with increasing future demand. This will particularly be true in the case of an increase of extreme climatic events, as predicted in numerous climatic models. In the Caprivi aquifer (Nata Karoo Sub-basin), although recharge occurs predominantly through direct precipitation, some recharge from rivers also occurs along the major drainage channels within the northern parts of the aquifer. In the Cuvelai-Etosha Basin, some recharge from the Okavango River system in Angola is probably occurring. In the Eiseb Aquifer (Northern Kalahari / Karoo Basin) the majority of recharge occurs through surface runoff. 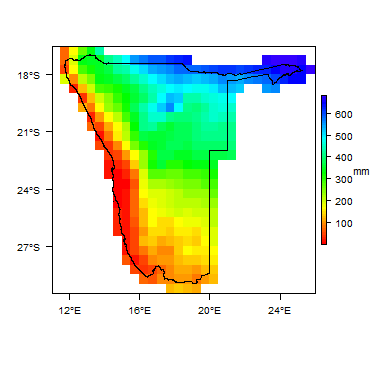 In the southeast Kalahari Karoo Basin, although the main recharge mechanism is through direct precipitation over depressions situated on the northwestern edge of the basin, a certain amount of recharge also occurs through major rainfall event runoff in the ephemeral rivers that flow across the aquifer system. Groundwater dependent ecosystems occur in west-flowing rivers and at river mouths. Riverine vegetation is dependent on shallow, fresh to brackish groundwater from alluvial aquifers, in an otherwise arid environment with saline groundwater. Animals such as the world renown ‘desert elephant’ also depend on that groundwater resource. In the Cuvelai-Etosha Basin, shallow groundwater and groundwater dependent ecosystems cover around 5% of the area. Groundwater in Coastal Basins often feeds estuaries along the coastline, forming prominent ecosystems, such as at Sandwich Harbour south of Walvis Bay, and the Orange River estuary on the border with South Africa. Along most of the ephemeral rivers within the country prominent wetlands can be formed. Vegetation associated with groundwater in ephemeral rivers forms important groundwater ecosystems for wildlife. The table below compares the availability of groundwater in Namibia with other water sources. Of the estimated 300 to 350 Mm³/year potential sustainable groundwater resources, there is a currently installed capacity of 145 Mm³/year, and current actual use of 95 Mm³/year (source: MAWF (2012) Water Investment Conference Report). In rural areas, groundwater is mainly used for domestic purposes and livestock watering. In urban areas, groundwater is used for domestic and industrial purposes. A number of major cities are 100% reliant on groundwater: Walvisbay, Swakopmund, Otjiwarongo, Tsumeb, Luderitz, Grootfontein and Usakos. Some major industries are highly dependent on groundwater, including: the Rössing Uranium Mine, Husab Mine and Langer Heinrich Mine (although new desalination plants in all three reduce dependency on groundwater); the Otjikoto Gold Mine, which is 100% reliant on groundwater; and the Scorpion zinc mine. In the agricultural sector, groundwater is largely used for livestock. Groundwater use for irrigation is not encouraged by Government, but is used in some areas, particularly the Otavi karst area, the Stampriet artesian basin, and along west-flowing ephemeral rivers. A particularly practical groundwater management activity is the delineation of groundwater control areas, which include the most highly productive aquifers, to promote the use of groundwater resources on a long-term sustainable basis. The Department of Water Affairs and Forestry, Division Geohydrology, carries out water level monitoring at about 660 boreholes across the country. Monitoring is mainly done using automatic data loggers with daily to weekly measurements. The same division carries out water quality monitoring at about 50 boreholes. The monitoring network was not designed strategically, and is not distributed across all relevant aquifers. Monitoring data have in the past been stored in the Geohydrology Division filing system, but a National Groundwater Database (GROWAS) has been designed to be the main storage facility for groundwater monitoring data, and is under improvement. All were included in the Transboundary Waters Assessment Programme (TWAP) carried out by GEF/UNESCO. More information about TWAP can be found on the Transboundary aquifers resources page. The Department of Water Affairs and Forestry (DWAF), with BGR, carried out a project on the hydrogeology and sedimentology of the Kalahari Sediments of the Cuvelai-Etosha Basin. More information can be found on the Namibia Groundwater Projects page. Information on major groundwater projects in Namibia, including links to project results and outputs, can be found on the Namibia Groundwater Projects page. The Namibian Hydrogeological Association, a non-profit network of groundwater professionals, maintains a website with details of members and the main groundwater projects they have worked on. Many of the references listed on this page, and others relating to the hydrogeology of Namibia, can be accessed through the Africa Groundwater Literature Archive. Christelis G and Struckmeier W (Editors). 2001 (2011). Groundwater in Namibia: an explanation to the Hydrogeological Map. Ministry of Agriculture, Water and Rural Development, Namibia. (First edition December 2001; unrevised second edition January 2011). Environmental Engineering Services. 2009. Artificial Recharge of the Windhoek Aquifer as best option for supply augmentation to the Central Area of Namibia. Draft Report, Department of Water Affairs and Forestry (unpublished). This page was last modified on 13 March 2019, at 11:56.